Get to know the songs playing around you with our list of the Best Songs Recognizer Apps. There are times when you get to listen to some songs which might have a long-lasting effect on you, but somehow you find it difficult to get the song’s name or even the singer. At this point, you may need to ask around for the song info, that is what song is this or playing? However, this at some point might be quite tasking, but trust the unwavering Android technology to get a solution to this mystery. Google assistant is now able to identify what song is playing near you, and there other apps that can do this perfectly too. 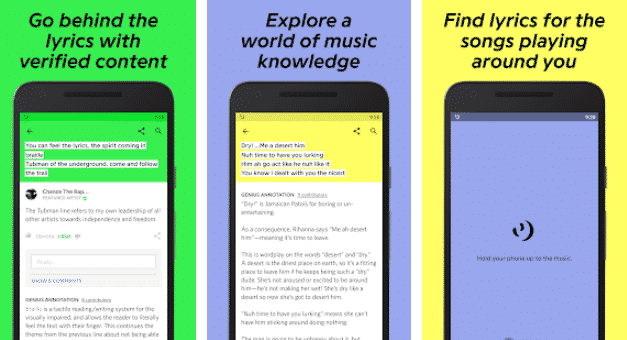 Owing to the ever-needful nature of Android users for wanting to solve the aforementioned riddle, Android developers have gone extra miles to create apps that can adequately recognize the music being played without you having to ask around for it. However, these apps aren’t in all-time perfect but to an extent, they deliver worthwhile musical content. Also, these apps are vulnerable to not working in noisy areas as well as croaky and not easy to understand songs. In this article, we have been able to provide the list of the best Songs recognizer apps available on Android and iOS devices. It is usually recommended that users have at least two of these best Songs recognizer apps on their Smartphone as this will help clarify any issues that might arise in detecting music. Google Assistant is no longer new to many of us, we can search literally anything on the app just by saying OK Google or Hey Google. When it comes to identifying songs playing near you, Google Assistant is one of the best songs recognizer apps for Android. Somehow, this Google Assistant isn’t too much of an app as it more like very present in every Android phone and plays a significant addition to the operating system. However, the Google Assistant is designed in such a way that it can practically detect audios playing, which includes musical audios. Unlike other apps, this Google is usually pre-installed on your device, so what you have to do is, set it rolling and be on your way to getting any music of your choice. Conversely, the SoundHound comes next on our list. 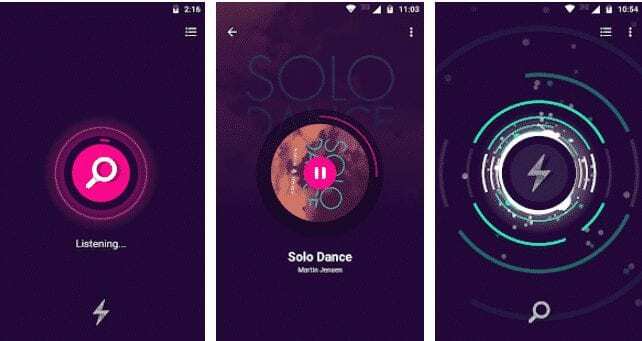 This app ranks among the best apps to identify songs on Android owing to the clean, friendly user interface, reliable detection and fast results. Once installed, the apps display a big detection button as it is shown on the home screen; all you need to do is click on it and let it start the process of detecting the music played. It is quite similar to what Google Assistant in that SoundHound comes with ‘OK Hound, an incredibly fast and accurate way to find great music with your voice. Hound is built with natural language understanding, so speak like you would with a friend. When you Simply say ‘OK Hound.. from any screen or tap the microphone on the play page. Once you see the listening panel, you can follow up with commands including OK Hound, Play Hello by Adele, OK Hound…what’s that song? ’OK Hound…Add this song to my playlist’ etc. Nonetheless, the results aren’t to be trusted in a too noisy environment. Also, the app has a great capability to connect to Spotify and get lyrics for the song being played. The Shazam app has been around for quite some time now and has proven its dependability, hence why it is on our list. On the app’s main interface, there is a huge clickable button that allows the apt music detection process. Afterwards, the song presents you related video clips, tracks and song lyrics. Also, this app gives users the option of previewing the song before streaming or downloading it. Just like every other great Android app, it usually offers a lot of easy, accessible features. We like the smart seek feature to find our personal favourite part of the song. One huge button to identify songs that are playing in the background is there; also you can also enjoy song lyrics with the music you’re playing. This app also adequately supports lyrics and video options from Spotify, Pandora, Google Play Music as well as Soundcloud. Genius is still one of the Best Songs Recognizer Apps you can use to detect what songs is this. The app has issues in dealing with obscure tracks just like every other app on this list. Nonetheless, the sleekness feature is one we cannot overlook. The Genius app has a cool looking material design of yellow and white colour scheme, which makes it quite unique and awesome looking. Once you are on it, press the recognize button on the bottom right of the screen and the app will start listening and appositely, give you musical results. MusicID is another great app among the best songs identifier apps. It helps to instantly identify music playing around you and is free to download on the app store. It will also give details of the songs plus the album art for your favourite artists . The app features the ability to add a note so you can remember where you identified that amazing song. Like I said earlier, no app is an all in all when it comes to recognizing songs, it is advisable you have one or two of them installed on your phone. BeatFind, as the name suggests, is among our best songs recognizer apps you can download. It is available on the app store and is free to download. An intuitive Visualizer that is able to get sound from a microphone and synchronizes with music. It features Strobe light effect using device flash in sync with music beats. Music recognition mode where you can search and identify the song you like (Powered by ACRCloud). History list of recognized songs. The identified song can be previewed. Another great app on the list of songs identifier apps. The app has over 1million download on troeGoogle play store and is loved for what it does. The app is able to recognize the title and artist name of the music playing around you which it mostly gets from Gracenote. The music recognition database of Gracenote is the largest in the world, the number of the music registered into this database is about 130 million, the number searched by this database is about 800 million per day, and the music recognition engine of Gracenote is adopted as Toyota, Apple, KDDI etc. This gives the music identification a very good platform to identify songs easily. Conclusively, all the above-mentioned apps are some of the best music recognition apps for Android. Ultimately, there are some other apps in the same genre but some of them have really weird issues while dealing with permission, some of which might kind of require you to have a camera or video access. But none of the above-named app offers such uncanny options and aside from that, they are just the best from the rest available.